Survival horror is having a bit of a revival right now, and we're certainly not complaining. Alien: Isolation, Outlast, Dying Light, Silent Hills - whether it's thanks to The Last of Us or down to the new generation of consoles, the genre is enjoying a massive second wind. 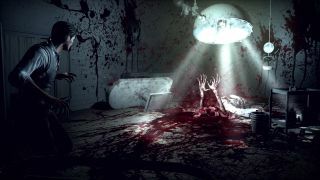 The Evil Within, the debut game from Resident Evil creator Shinji Mikami's Tango Gameworks, is one of the names leading the charge - we can confirm that this ain't the game your gran will be playing on Christmas morning. But scaring the bejesus out of video game players is no easy task, so we sat down with Mikami to chat about the ways in which The Evil Within plays on human psychology, and how it deviates from past horror games, in order to crawl beneath the player's skin. TR: It feels like the horror genre is having a bit of a comeback right now. How much does The Evil Within owe to games of the past, and how much does it deviate? SM: This game is a return to the basics of survival horror. If you were to compare it to Resident Evil, it would probably be somewhere between 1 and 4. We've worked hard to get the feeling of horror at the heart of The Evil Within to coexist with the fun of playing the game, and I think that we've been successful. More often than not, my past experience wasn't lining up with how I wanted to create this game, leaving me fighting against my instincts. This especially happened a lot with regard to team management, not just with the question of how to best add to the feeling of horror. TR: How is The Evil Within different in the way it uses visuals and sound to scare the player? TR: Third-person perspective can make horror games a bit more tricky than first-person titles. What have you done to ensure that the horror still feels as real even though it's not seen directly through the eyes of the player? SM: While third-person might lose to first-person in terms of immersiveness, I think that being able to see the protagonist's frightened expression can contribute to the feeling of fear. Another advantage of third-person is that it's a lot easier for the player to understand what's going on around them when they get hit by an enemy. TR: This is a game that's all about the scares - how does The Evil Within play on people's fears? SM: We've devised various post-effects in order to create deep and striking lighting and shadow effects to enhance the player's feelings of fear and disgust, and to really bring out the atmosphere of the game. We're also using our own slime shaders and super-fast GPU-side collision detection to replicate realistic blood splatter. If the player character is too agile, then it will detract from the feeling of horror. At the same time, however, if the movement is too realistic then the player will end up getting stressed out by the controls. We've worked to keep movement and actions as realistic as possible while also placing a great deal of emphasis on control responsiveness. In addition to the difficulty level that is selected by the player, there is also a hidden difficulty modifier in the game. If you play well, the difficulty level will increase. This will cause the AI to behave more intelligently, helping to maintain the tension of combat. The drop rates for ammo and recovery items are also finely adjusted to keep the player right at the level where they have just enough resources to barely make it through.